Navigating a complex, evolving capacity market and structuring layered hedges for a 6 property, 41 million kWh per year commercial real estate portfolio. Annual savings of $470,000 (18%) vs. lowest market price fixed product, 2% ($45,000) savings vs. un-hedged, straight day-ahead index rate, and 4% ($90,000) savings vs. capacity market. 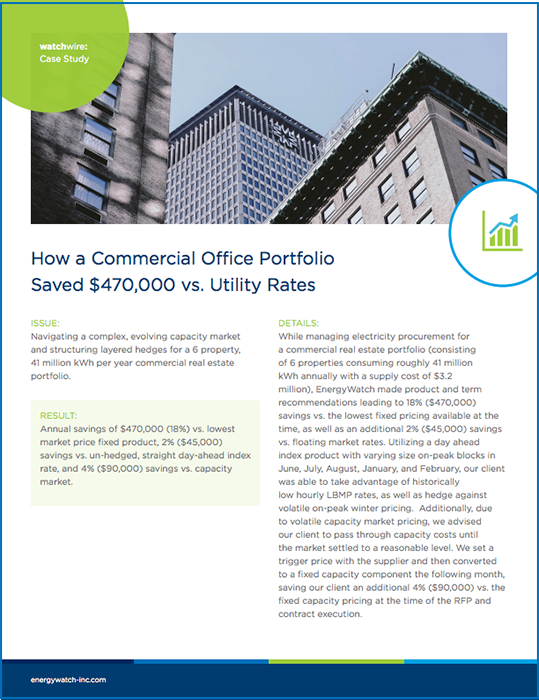 While managing electricity procurement for a commercial real estate portfolio (consisting of 6 properties consuming roughly 41 million kWh annually with a supply cost of $3.2 million), EnergyWatch made product and term recommendations leading to 18% ($470,000) savings vs. the lowest fixed pricing available at the time, as well as an additional 2% ($45,000) savings vs. floating market rates. Utilizing a day ahead index product with varying size on-peak blocks in June, July, August, January, and February, our client was able to take advantage of historically low hourly LBMP rates, as well as hedge against volatile on-peak winter pricing. Additionally, due to volatile capacity market pricing, we advised our client to pass through capacity costs until the market settled to a reasonable level. We set a trigger price with the supplier and then converted to a fixed capacity component the following month, saving our client an additional 4% ($90,000) vs. the fixed capacity pricing at the time of the RFP and contract execution.